Writer Abroad is excited to welcome back Alan Paul, award-winning Wall Street Journal columnist and author of Big in China. He interviewed here last year, discussing his “rock star” fame in China and also how he reinvented himself abroad. Since then, he has published his memoir. Now he answers questions about how to go from blog to book deal and how to promote that book once it hits the shelves. You kept a blog while you lived in China, which you claim you treated like a job. How did writing the blog ultimately lead to your column in the Wall Street Journal? And how did it help you write Big in China? To be clear, I treated it as a job in terms of the serious effort and intention I put into my blog posts, not in terms of working on it for 8 hours a day. Before moving to Beijing I had the vague idea of writing a column about my life there and the editor of the Wall Street Journal Online had agreed to consider them, but he was completely non committal and I really wasn’t sure how to focus them. Because I was writing so much and with such focused intent on my blog, I began to synthesize my experiences and get great feedback from people, which boosted my feeling that what I was writing was interesting and worthwhile. I took three of my favorite posts, edited them and submitted them. These became the first few Expat Life columns, so the connection was very direct. The leap to the book was not as direct, but without the columns I doubt it ever would have happened. The blog posts also helped me as I was writing the book because I was able to go back and insert some great details, some of which I had forgotten and certainly would have been lost. I read through the blog for inspiration and again to make things more specific, but I tried to write the book from scratch and then go back and burnish. I didn’t want it to feel like an expanded, stitched-together blog. Your book is ultimately about reinvention. Can you talk about your path from “trailing spouse”—a term you describe hating as much as I do—to Chinese rock star? The first step was viewing the blank slate that being a “trailing spouse” presented as a wonderful opportunity. I thought the term was insulting and sort of laughable but I didn’t dwell on it; I was more like, “Trail this!” Once I plunged into life there, one thing led to another. It was all about being open to new people and opportunities. By the time I met my band-partner-to-be Woodie Wu, my confidence was high enough to seize the moment when he asked me if I wanted to play with him, even though I thought he was above me musically and I had to swallow some fear to jump on stage together. You turned a personal story about living in China—a place not many Americans will ever go—into a universal story about reinvention. Do you have any tips for other writers on turning the personal into the universal? You have to work hard. I don’t mean to be flip, but it was a lot more work than I had anticipated. I thought with almost 100 columns and over 1,000 blog posts, the book would come together more easily, but you pinpointed the precise thing that made it so difficult; turning the personal into the universal. To do this, I think you have to really be self-critical and try to step out of yourself and think about what part of your experience is interesting and why. I had to leave some of my favorite stories and pieces of writing out because I didn’t think they worked in this way and it was really important to me. I think that you have to have really good details to make the writing come to life and then you have to be able to pull back and see how whatever you are writing about fits into a larger narrative. Since this site is for writers, can you talk a little about how you plan to promote your book? Are you going to perform on your book tour? Do writers even go on book tours these days? Or is everything via the Internet? I have a big publisher, Harper Collins, behind me, and they have really helped – especially with big media, like getting the book reviewed in USA Today and the Washington Post and getting me on the Leonard Lopate Show on WNYC in New York. But you can’t just rely on them. You have to hustle and be ready to plunge in and do a lot of things for yourself. I have spent a lot of time reaching out to blogs like yours that I respect and read and thought were a good fit for the book. I am writing this from the plane back from a week-long book tour of the West Coast. We still do them, but in a more limited way. I am mostly going to places where I have a reason to go – great friends in Seattle and San Francisco and Berkeley; my hometown of Pittsburgh; my college town of Ann Arbor, where I will also meet with writing students taught by my old professors. And I am doing a lot around New York and New Jersey. I’m fortunate enough that I can make this pretty much my full time job right now. I am writing guest blog posts as fast as my fingers can type and I have really enjoyed doing so. How did living abroad liberate you as a writer? Do you still feel that liberation now, even back in the States? It liberated me as a person in many ways, most of which I do still feel. I gained a lot of confidence in my ability to do something as a writer I sort of knew I could do but had not had the opportunity to put into action very much for a long time: connect with readers across a wide spectrum while exploring family life and big-picture personal issues. I had been a bit frustrated because I sort of knew I could do that, but I was mostly writing about music and basketball – and finding ways to fit everything into those contexts, unsure if anyone was even noticing. But now that I have that confidence, I am not going back. And I feel the same way about my music. I went months without performing while finishing up the book and getting ready to promote it. Since it came out, I have been able to play with two great bands at launch parties featuring guitarists who are heroes of mine and they have gone really well. I feel like I am singing with just as much passion but better control and more authority than ever. I have crossed the river of doubt and now I start out a show knowing it will be okay and striving for it to be great. One of my favorite lines in your book is a quote from your wife at the end of Chapter 1, where she says, “We can spend the next three years in China. Or we can spend them talking about kitchen renovation.” You describe feeling a growing restlessness towards life in American suburbia. Now that you’ve returned, have you found that living in China has cured this? Or are you secretly yearning for that next adventure? Good question and one I am scared to answer. I am not currently yearning for that next adventure, but I’m not sure how much of that is due to the excitement of getting a book deal, writing a book, seeing it come out, and now promoting it. We haven’t had a lot of boring days. And we also did get around to that kitchen reconstruction and we did it without talking about it for three years. We actually gutted our house and did a major addition while I was writing this book. It was an insane thing to do, but after our exhilarating time in China, we sort of crave craziness and don’t fear chaos. I do fear having a crash when I finally ride this book as long and far as I can – but I won’t give up until I’m sure that I have done so. I’m really proud of Big in China and happy to stand behind it and try to get as many people as possible to find about it. I hope it can inspire some people to take off on some adventures of their own whether in China or their own backyards. Ah, the million dollar question. A lot of my more marketing and pr-oriented friends told me I had to have the next move planned and ready to go during this window when people were paying attention to me, but I guess that’s why I’m a writer; I don’t work like that. I have my eye on this ball and every experience I have tells me not to lose focus. It’s how I succeeded with the band and the column and Guitar World and Slam…besides I’ve gotten pretty far by winging it with serious intent. There is also some pretty serious movie interest that I am exploring right now, so who knows how long and how far I will ride Big in China? When it’s time to move on, I am confident that something will have presented itself. Thanks for your time and interest. As I have told you before, I think your site is a great resource for so many of us current, former or future writers abroad. It’s good to recognize one another as a community. 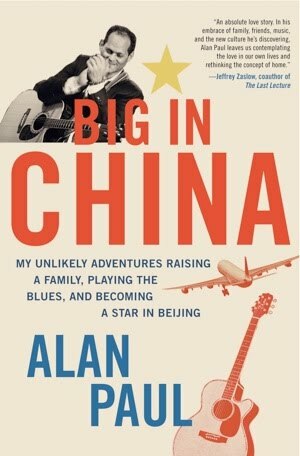 Alan Paul’s book, Big in China: My Unlikely Adventures Raising a Family, Playing the Blues, and Becoming a Rock Star in Beijing, is now available. Fantastic interview, Chantal. As someone who has spent half of her adult life living in countries other than the one of her birth, I can relate with Mr. Paul's feelings of restlessness in regards to life in cookie cutter suburbia. That being said, as soon as I get settled in a new land, I begin missing my homeland. It's a constant tug of war for me; the desire for new experiences and cultures and the desire to settle and have roots. Thanks again for your time to do the interview. Glad you enjoyed it. It's always a struggle, isn't it? Between the restlessness and the homesickness, I know exactly how you feel about being between two different worlds. He did this seriously pretty helpful to do. Photograph after this for long periods plus I actually assume concerning acquired a great deal of! At this moment please click here Cash Advance Each of Superb posting. Thank you so much for sharing here the best interview.